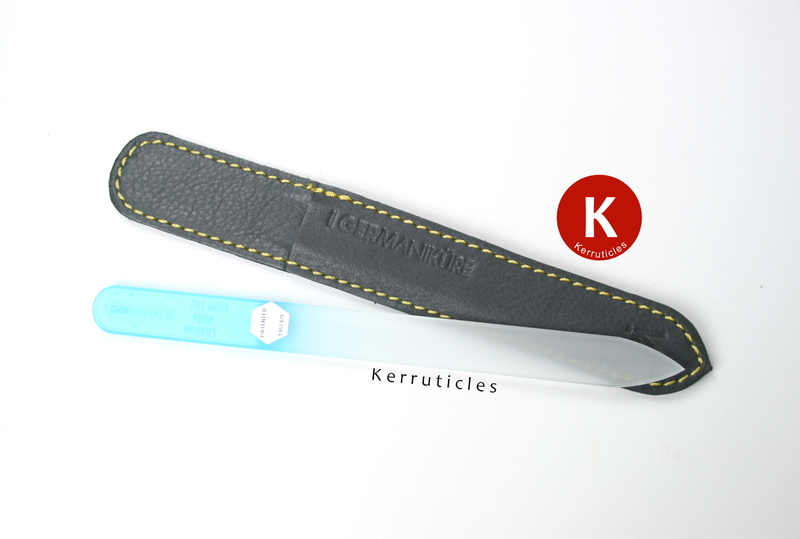 Today I am reviewing a GERmanikure crystal glass nail file. GERmanikure is a a family-owned business based in Florida, USA. They produce a range of quality manicure products, including nail files, scissors and cuticle nippers, all sold through retailer zamberg.com. The crystal nail files are obtained under patent from the Czech Republic – a country renowned for quality glassware. They are 3mm thick and manufactured from authentic bohemian crystal glass. The textured grit is permanently etched into the crystal, meaning it won’t degrade over time. The glass is also chemically tempered, so these files are harder than normal, heat-tempered glass, which means they offer more resistance against breaking. They come in a range of colours and are presented in a quality leather pouch. You can choose from a number of colours and from a range of pre-etched inspirational, spiritual, motivational or humorous phrases. So you can find a phrase to match your own character – or you can choose a plain one without any wording. I chose a blue one – my favourite colour – which says “File away your worries”, which I found amusing. Although I was rather tempted by “Eat more cake”! I like the GERmanikure approach: they are an ethical, land-fill conscious company, never using plastic or cardboard packaging. They are socially responsible too, and run an anti-child labour campaign and contribute a portion of all sales to families victimised by child labour in Pakistan and Vietnam. I only use crystal nail files as they are better for your nails. They don’t scrape and tear your nail, like other files do. This separates the layers of keratin in the nail, making them more prone to braking, chipping and peeling. I own a few crystal files; I have ones from Leighton Denny, Ciaté and She Sells Seashells. This GERmanikure one seems stronger in that it takes off the length more quickly. That’s great for me as my nails grow quite quickly and I file them weekly at least. Until recently, I have mainly been using my Leighton Denny file as it lives in my office drawer. But it takes much longer to file my nails than this GERmanikure nail file does, so I’m relegating the Leighton Denny to my handbag! Using a crystal glass nail file is one of the fundamental things you need to do if you want to grow long nails – (I have other nail care tips here) – and I wholeheartedly recommend the GERmanikure one. 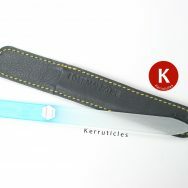 You can buy GERmanikure files from zamberg.com. This nail file was sent to me for review. All views expressed in this post are my own, honest and unbiased opinions. Great review on this crystal glass nail file. Never heard of this company but it sounds nice.